Cables: Arkana Physical Research Loom, Audio Art SE and Classic cable looms, JPS Labs Ultraconductor 2 speaker cables, Madison Audio Lab E3 Extreme 1 Interconnects/Extreme 2 speaker cables, Signal Cable Silver Reference interconnects and speaker cables, digital optical and coax cable, Audio Sensibility Impact SE balanced interconnects, DH Lab Power Plus AC cable. Groundbreaking audio products are quite rare. Sometimes they take the guise of new tech. Sometimes they rethink existing approaches. 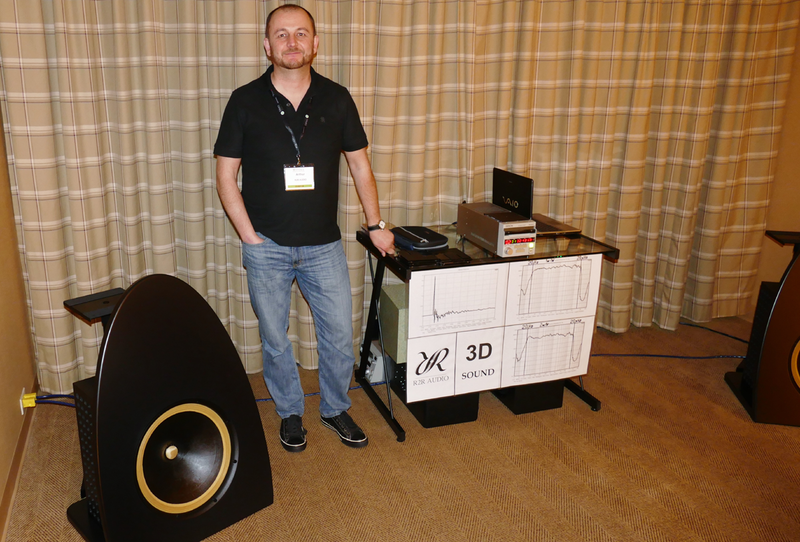 The R2R Audio loudspeaker caught my attention at TAVES 2014 by making some very respectable sound with very bold claims. This compact open-baffle widebander promised leading-edge technology and specs well beyond the breed plus the potential to challenge the best of the best. Think low-mass single driver, no enclosure, the agility of a thin film and bass flat to 20 cycles. Holy Grail material. After chatting with company President Artur Ayvazov, arrangements were made for a formal review. Obvious questions first. Who is R2R Audio and why should this speaker be on your radar? The term fresh face is often used for newcomers but in this case would be only half right. Whilst this 15-inch full-range DSP’d and amplified loudspeaker does mark R2R’s first formal consumer entry, it is backed by 30 years of experience servicing the custom, pro and industrial sectors. The company’s handiwork can be found in venues ranging from open air stadiums, concert halls and cinemas to active electrostatic speakers and acoustic systems, hydro-acoustic transducers for underwater music reproduction, recording studio equipment, car audio, acoustic high-pressure equipment for electric components testing and many other specialty sectors. R2R have concentrated on products that are exclusively designed and hand-crafted in small quantities. They work with each and every customer (private, corporate, government institutions etc.) to cater to unique needs. These folks aren’t aspiring beginners. They are consolidating their vast research and experience into a single consumer product. If the price seems high, it’s because they are aiming at the top. The R2R Audio FR15A flagship speaker is really a speaker system. It comes fully equipped with a 700w/4Ω Hypex UcD amplifier, DSP, power cables and interconnects. If you pursue a purist route, all that is further required is a source with a volume control. Why have R2R adopted the system approach? "Our speakers are a turnkey system fully optimized for the most discerning audiophiles and audio professionals who aren't interested or inclined to take the time to tweak what is already close to perfection. Our product is for the type of high-end customer who understands that every part makes a difference. In this system everything has been matched by some of the best acoustical engineers in the world. They have taken hundreds if not thousands of hours to offer the best which money can buy and at a reasonable cost considering what it would take to even come close to its capabilities with existing consumer equipment. Usually we instruct the user that the system is fully optimized and should be used as is, with our suggested parts and settings. But we accept that people will do things their own way, incorporate things they already have or change things as they get curious. There will always be those types of hobbyists. Our product is really more for the informed perfectionist who simply wants the very best musical reproduction with the lowest investment of time." At the heart of the design is a 15-inch widebander which is a formidable beast. In R2R’s conceptual realization, this is a true single-cone affair with no coax tweeter, no crossover handoff, no whizzer cone. It boasts specs that throw down gauntlets across the board. 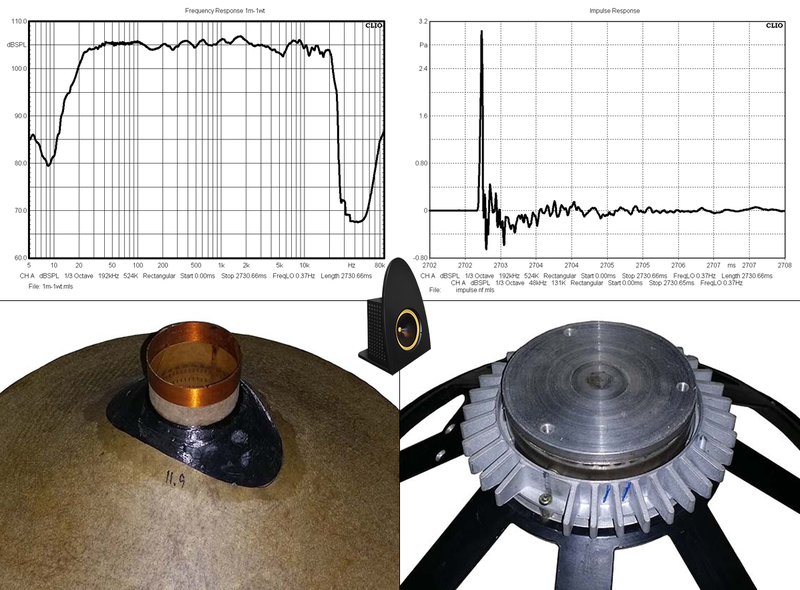 20Hz – 20kHz response ±2dB, 104dB sensitivity, 11.9 gram cone weight, ±5mm linear excursion, Neodymium magnets, 2.2 Tesla flux density and an impulse response that goes toe to toe with thin-film technology. The cone material is a unique high-modulus Polyaramid treated with liquid Kevlar™ and Fullerene C60 nano particles. Power handling is 60Wrms with 180w peaks. In short, it is a state-of-the-art ‘conventional’ dynamic driver which claims to be highly responsive, controlled and offering true wideband response and efficiency. All the traditional SOTA virtues are backed by current DSP and top-notch D-class amp technologies in a simple user-friendly package. Why a single widebander instead of multiple drivers? "With a single driver we have the same speed and sound character at all frequencies. It maintains the same tonality at different distances and listening levels. Our systems excel at a non-fatiguing sound due to minimal group delay." For a comparative analysis of the speaker’s speed, R2R supplied some extra information. "Our unique production technology allows us to achieve up to 12km/sec of sound velocity with our driver’s combined moving mass. The maximum velocity of sound in moving elements made from traditional materials cannot exceed 3km/sec." In layman’s terms, the R2R FR15A is claimed to be wickedly fast.